Vial-Matas describes his early struggles as a writer with a lightness and gentle mockery that conveys both the hardship and the freedom he experiences. He refers frequently to writers and writing; Hemingway, of course, but also many others, including those, like Georges Perec, he sees in Paris (typically, he simply stares at him). One of the most attractive things about Vila-Matas’ work is the way in which literature is unashamedly foregrounded as the subject. 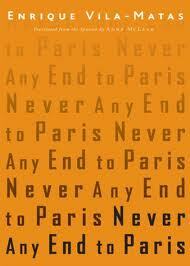 Never Any End to Paris is a great addition to Vila-Matas’ work in English. Even better, a fourth book, Dublinesca, is due to follow next year. Danger rating: beware of names dropping, but they fall so lightly they cannot harm you. Vila-Matas wears his erudition on his sleeve, but you might suspect it the costume of a clown. This entry was posted on August 19, 2011 at 6:49 pm and is filed under The Year of Reading Dangerously. You can follow any responses to this entry through the RSS 2.0 feed. You can leave a response, or trackback from your own site. An excellent review, Grant, and I love your choice of quote on irony and its absence from EV-M’s life as a young writer! Thanks for the link to this post; I was wondering how I’d missed it, but I can see it’s from 2011…you were ahead of the game!